Unsurprisingly, a new joint poll by the Business Times (BT) and the Research Consultancy Bureau (RCB) on the dengue crisis that has engulfed the country, reveals mounting public anger against the Government and local authorities for failing to contain the epidemic. 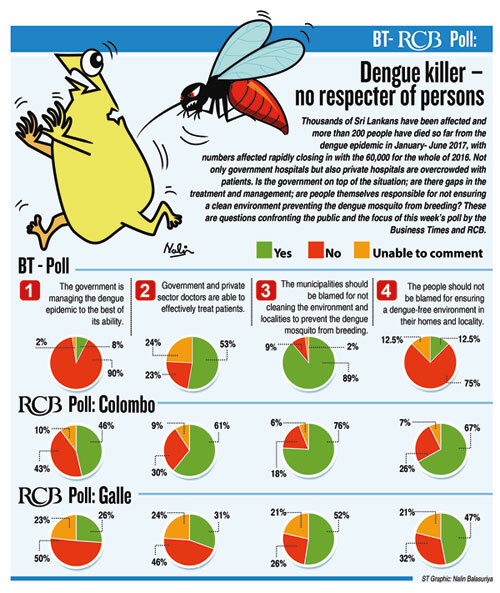 With both public and private hospitals overflowing with patients and public concern over dengue at its peak, the BT-RCB poll (conducted on email and on the street) saw dozens of those polled venting their anger and frustration with comments flowing. But respondents also sympathised with the Government saying the state has its hands full and cited ‘public apathy’ as one of the main problems. “The people in this country wait till everything is provided by the Government. The fault lies with the public,” one respondent in the street poll conducted by the RCB, said. Another said that while the Government is unable to visit every home to prevent an outbreak and has limited resources, the public too has a responsibility towards ensuring a clean environment. With strikes and protests by unionised government doctors, the Government Medical Officers Union (GMOA) was not spared. “The treatment of the patients are regularly neglected due to doctors’ strikes,” said a respondent. The poll also drew a caustic comment from one respondent: “Teach civics and manners in the classroom (as people don’t know their duties and obligations).” Another frustrated Colombo resident urged the authorities to hold the Colombo municipal election fast with the garbage and dengue issue being the main platform plank! Titled ‘Dengue – No respecter of persons’, the poll on email (by the BT) and on the street (in Colombo and Galle by RCB), triggered some interesting data. The results of the poll is seen in the graphic on this page and what is most interesting was that street respondents in Galle differed in their view from Colombo. While Colombo was unsure whether the Government was managing the situation well (46 per cent agreed while 43 per cent disagreed), Galle residents gave a 50 per cent (disagreed) response with only 26 per cent agreeing. More than 600 people were polled in the street survey while the email base covered over 900 respondents. Street respondents lamented that while the rich can afford to go to private hospitals, the poor flock around overcrowded state facilities and urged improvements there. “The Health Minster is always talking and less work,” one respondent claimed while another claimed that the public was inconvenienced due to the classification of garbage and not been collected on time. The poll revealed that another issue that has triggered the crisis was that the provincial councils and local bodies were not cooperating with the present regime. “They are waiting for the regime to fall,” said a respondent. Harder fines and penalties were urged against offenders dumping garbage. A Galle resident said that small and medium industries should be held responsible for dumping of industrial waste.